Michigan’s 2018 U.S. Senate Race Didn’t Attract The Big Money That Races In Other States Did. It Didn’t Even Top The Money Total From Michigan’s Last Senate Race. LANSING (APRIL 11, 2019) — While campaign finance records fell like dominos during Michigan’s 2018 election, the state’s U.S. Senate race was a different story. Democrat Debbie Stabenow won re-election against Republican John James in a contest that attracted about $40 million overall, according to an analysis of independent spending reports and candidate fundraising disclosures. The total may seem like a large one, but it wasn’t when compared to other competitive U.S. Senate contests in the year 2018. Michigan’s U.S. Senate race was among the 10 closest nationally, but it wasn’t among the 10 most expensive. The 10 most expensive races all attracted at least $66 million in total independent spending and general election and primary candidate spending, according to tracking by the Center for Responsive Politics. Even Michigan’s last Senate race in 2014 was more expensive than the 2018 race. The 2014 race attracted about $58.5 million overall, including $36.3 million in spending by groups acting outside of the candidates’ campaigns. While that race was for an open seat, Democrat Gary Peters defeated Republican Terri Lynn Land by 13 percentage points. 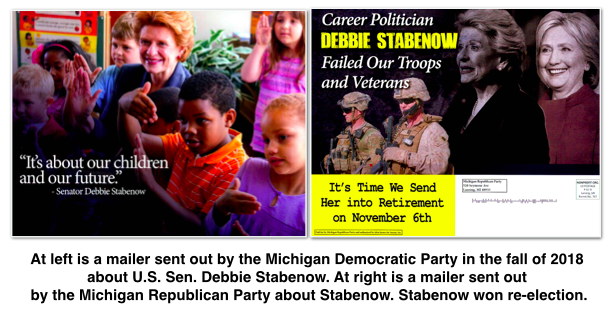 Stabenow beat James, a military veteran and businessman from Farmington Hills, by only 6 percentage points. Across the primary and general election, the 2018 race saw only about $5.1 million in independent spending — spending to influence the race that’s not coordinated with the candidates. That’s 14 percent of the independent spending in Michigan’s 2014 race. It’s also much less than what other states attracted in 2018. Florida’s U.S. Senate race — the most expensive nationally — saw incumbent Democrat Bill Nelson lose to Republican then-Gov. Rick Scott and spurred about $92.8 million in outside spending, according to the Center for Responsive Politics. For the election cycle, Stabenow’s campaign reported raising $17.8 million and reported spending $17.2 million. Of the fundraising total, $4.0 million came from political action committees (PACs), according to her filings with the Federal Election Commission. At the federal level, PACs could directly give a candidate up to $5,000 per election ($5,000 for the primary and $5,000 for the general election). Among the many PACs that gave $10,000 to Stabenow were the United Auto Workers, Delta Dental, Morgan Stanley, the American Hospital Association and the National Education Fund for Children & Public Education. The independent spending to benefit Stabenow was dominated by advertisements early in the campaign from the nonprofit American Chemistry Council, which spent $571,700 on pro-Stabenow ads that aired in 2017, according to disclosures. A PAC called the Progressive Turnout Project ($33,1010), the AFL-CIO Political Education Treasury Fund ($22,844) and the Humane Society Legislative Fund ($13,270) spent independently to benefit Stabenow. As for James, his campaign directly raised $12.5 million and spent $11.3 million. PACs gave $375,144 of that total, according to his disclosures. James was more heavily backed by independent spenders acting outside of his campaign than Stabenow. They spent $4.5 million across the primary and general elections to boost his chances. While there are limits on how much candidates can raise from specific sources, many independent spenders can raise unlimited amounts from donors. A super PAC called ESAFUND, formerly known as Ending Spending Action, spent $1.1 million to benefit James. Its top donors over 2017 and 2018, according to disclosures, were Marlene Ricketts, whose spouse, Joe Ricketts, is the former CEO of TD Ameritrade, at $1.5 million and casino moguls Miriam and Sheldon Adelson, at $2.0 million. West Michigan businessman Dan DeVos also gave $300,000, according to disclosures. Another super PAC called Outsider PAC backed James in both the primary and general elections. It spent about $857,875 to support James or to criticize his opponents. The PAC’s top donors were Illinois businessman RIchard Uihlein, who gave $200,000, Donald Foss, chairman of Credit Acceptance Corporation, who gave $100,000, and attorney Sean Cotton, who gave $100,000. Members of the DeVos family combined to chip in $100,000 as well. The PAC officially formed in May 2018, three months before the primary election. 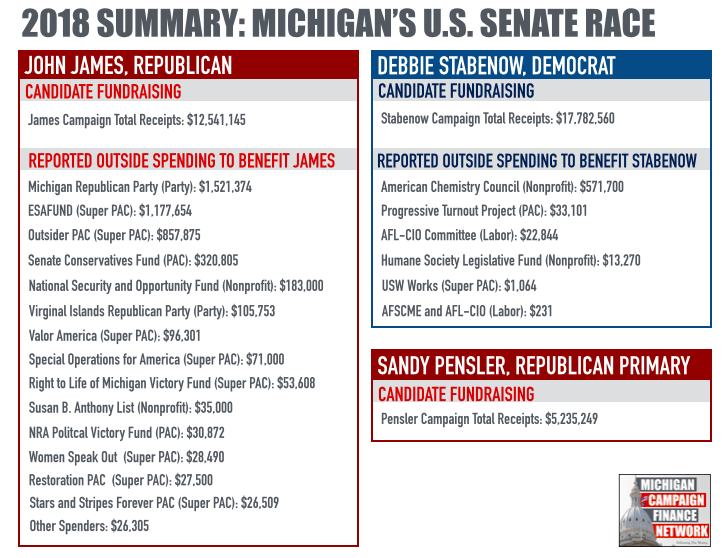 Of the $4.5 million in outside spending that benefited James, about $459,000 went to his primary election race against self-funding businessman Sandy Pensler of Grosse Pointe, according to disclosures. Among the biggest spenders were Outsider PAC and the Senate Conservatives Fund. Pensler’s campaign raised and spent $5.2 million with $5.0 million coming from Pensler himself. The campaign was one of the most active TV advertisers in Michigan before the primary. James got 54.6 percent of the vote in the primary while Pensler got 45.3 percent.